85 Hour Prenatal Yoga Teacher Training, beginning August 2018! You will learn the science of pregnancy. The science will inform the yoga taught to pregnant women, so modification of yoga is not just about removing unsafe poses, but adding poses that meet the needs of the pregnant body. From conception to labor and delivery, you will learn to distinguish normal discomforts of pregnancy from warning signs of potential danger. 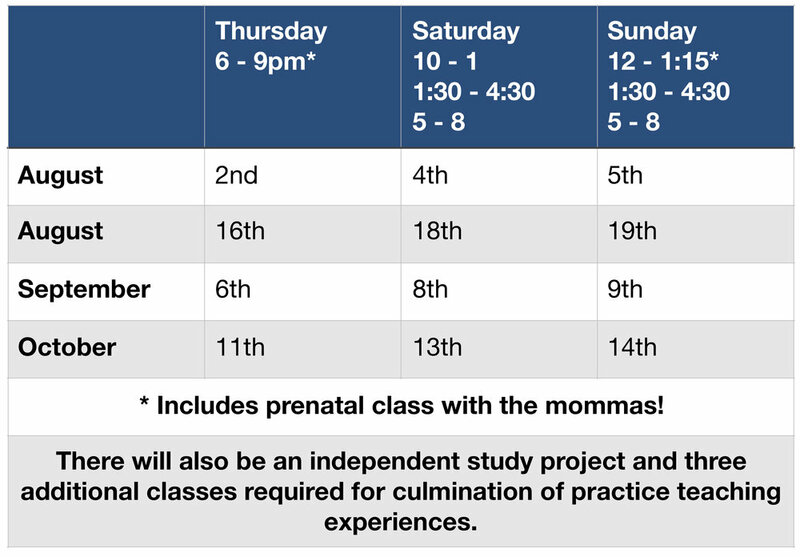 Community, education and challenge fuel the prenatal community at JOURNEYoga and this Prenatal Yoga Teacher Training. JOURNEYoga’s 85 Hour Prenatal Yoga Teacher Training is registered with Yoga Alliance. The toughest part of developing trainings has been finding times that work for everyone for training. If you have a day job, are teaching yoga and you may or may not have a child or four, when is there time to do 85 MORE hours of training? If you are interested and these hours/dates don't work for you, reach out anyway and let's see if we can figure something out. Would you like weekday, days? More weekends with fewer hours? Or is this wacky intense 4 weekend schedule exactly what you need? Email sarahlynn@journeyoga.com for more information. You are a 200 Hour Trained Yoga Teacher. Have actively taught a regular yoga class in the past and/or currently. Pregnancy and/or children are NOT a requirement for training. You will need to download the JOURNEYoga Prenatal Yoga Teacher Training Manual. You will only need to purchase The Pregnant Body Book. $1700 or $1500 with Early Bird Sign up before June 30. Training is based on $20/hour (about the cost of a drop-in yoga class). Sarah Lynn (E-RYT500, RPYT, RCYT) has been teaching yoga since 2002 and Prenatal Yoga nearly as long. Sarah Lynn founded JOURNEYoga in 2007 yet has a unique background as a women's health educator. 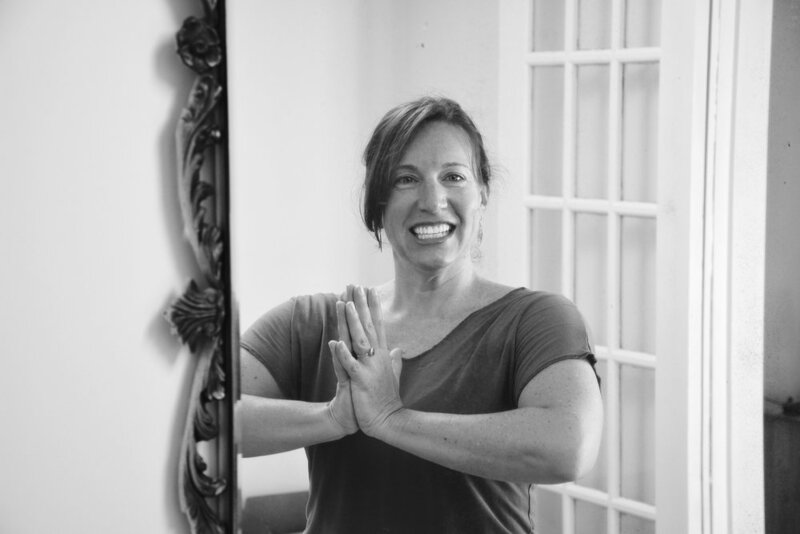 Sarah also received her MS in Integrative Medicine from George Washington University in 2017 and is Arlington's Yoga Teacher of the Year for 2018 as voted through the Arlington Sun Gazette. Sarah taught labor and delivery, pre- and post- natal nutrition, breast feeding, child development and parenting classes at the Teenage Parenting Programs of Arlington County. Sarah learned an immense amount from her mentor, a registered nurse, and the young mommas in the program. Sarah continued educating about women's health via pregnancy prevention programs in the public schools, teaching prenatal yoga and completing a doula training. Sarah performed doula services for 10 babies. What an AMAZING experience! Strength. Empowerment. Education. Anatomy. Community. Questions. Conversations. Expect it all in any class or training with Sarah Lynn!